Whether you’re out for a day hike with some friends or camping for the weekend with family, it’s no secret that your devices will run low on battery. Rather than missing out on an incredible photo or your favorite music, it’s a smart idea charge up on the go. 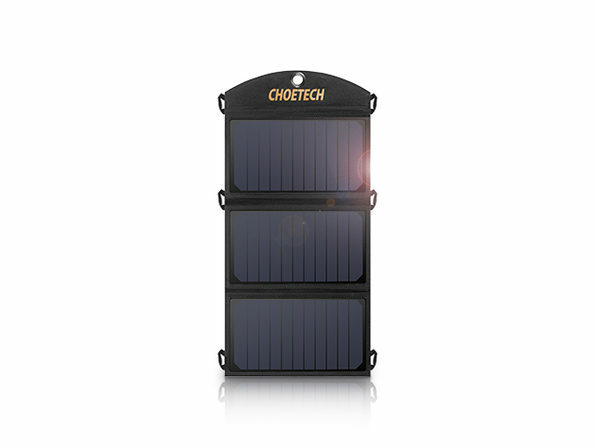 With the Choetech 19W Solar Charger, harness the power of the sun to charge up to two of your devices. This charger is fantastic for those who love staying active in the great outdoors. For starters, you can take it just about anywhere since it’s lightweight, portable, and engineered with weather resistant, durable materials. Meaning, no matter if you’re hanging out by the lake, hiking up a mountain, or kicking it at the beach, this charging accessory is tough enough to stand up to the elements. Plus, thanks to its foldable design, it’s a breeze attaching the charger to your backpack or tent, giving you quick access without adding any extra bulk. On top of all that, the charger gives you an impressive amount of power and convenience on the go. This means that you can charge two devices at once since it converts solar energy at a very efficient rate. What’s more, it’s compatible with all USB devices and delivers up to 2.4A output per port, ensuring your essential devices receive an optimal charging current with every use. Get it for $59.99 in The Daily Caller Shop.